Drapery hardware can transform any window treatment into a stunning focal point to match your contemporary, traditional, or modern style. Each piece is meticulously created by experienced artisans who pay great attention to the details during the crafting process. Our drapery hardware components are carefully selected to provide a complete selection of hardware styles to meet any discriminating eye. We offer a complete collection of hand-forged metal hardware and a wooden drapery hardware collection that offers sizes that are difficult to find. Whether your drapes are indoors or outdoors, we want to provide everything you need to transform your unfinished window into a completely accessorized window design. 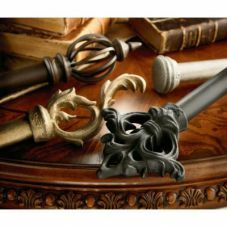 Let our bold and beautiful decorative hardware inspire you to create your very own drapery masterpiece.